Vultures circling above may seem like a bad sign. The good news is that if you can see them and think about what you see, they are not circling for you. Instead, there must be some other carcass nearby. 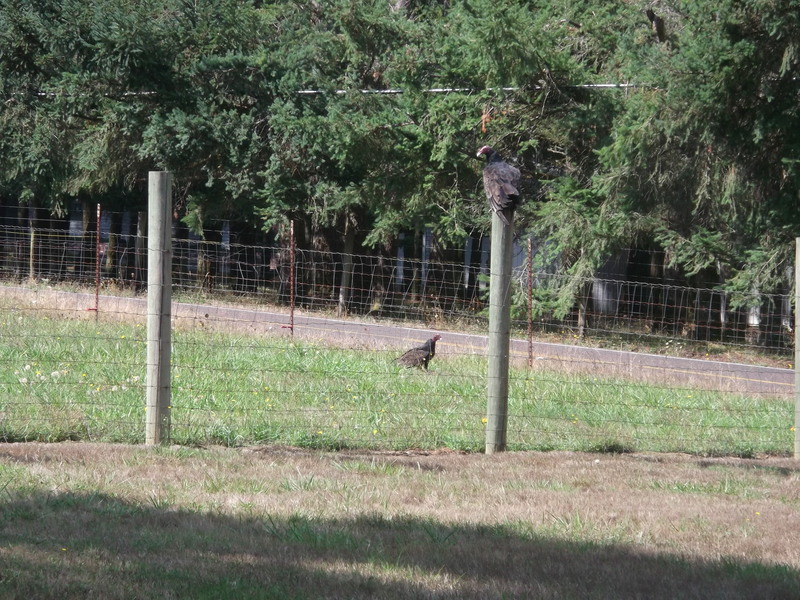 Sure enough, pretty soon the first one of these turkey buzzards lands in the neighbor’s meadow next door and starts wobbling from foot to foot while gravely regarding whatever is lying there in the weeds. It takes off again with a big swoosh when curiosity causes you to walk closer to see what kind of carrion is there. The attraction turns out to be what’s left of a raccoon. There’s been a family of raccoons coming around at night and having a late dinner under the bird feeder, hoovering up what the deer left when they got on their hind legs and spilled seed from the feeder hanging five feet off the ground. So there’s been a death in the raccoon family. Maybe this one got hit in the road and dragged himself a few feet into the meadow before expiring. Now it keeps the buzzards alive. First there was one of these stately birds with the turkey-like heads, then another. 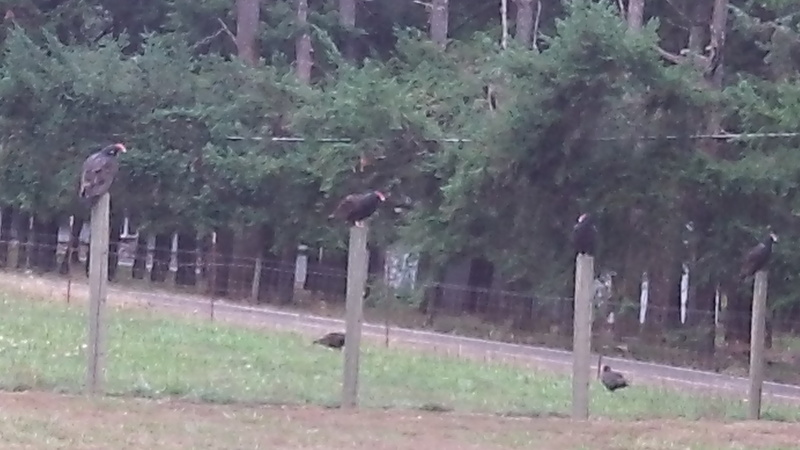 Those two must have told their friends: Next morning, there are six, one feeding while four wait their turns on the fence posts and one is down on deck. From Gloria Price, on Facebook: Saw that same thing, up close, when a possum died in our 1/4 acre yard. It was an amazing sight and scared our 16 lb. cat. There is a purpose for every living thing, even the ugly ones.